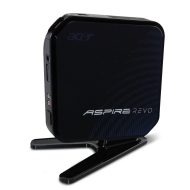 alaTest a collecté et analysé 292 avis de consommateurs et d'experts pour le produit Acer Aspire REVO R3700. La note moyenne du produit est 3.9 sur 5, tandis que les autres Ordinateurs de bureau ont une note moyenne de 4.1 sur 5. Les auteurs d'avis apprécient la taille. Après analyse des notes de consommateurs et d'experts, de l'âge du produit ainsi que d'autres facteurs, et comparé aux autres Ordinateurs de bureau, l'Acer Aspire REVO R3700 obtient un alaScore™ de 77/100 = Bien. Mały i uniwersalny komputer to marzenie wielu osób, jeżeli do damy do tego niską cenę, ładną stylistykę i moliwość odtwarzania dowolnego filmu HD to mamy produkt, który może zrewolucjonizować rynek. Takim komputerem jest Acer Reevo. Note: Requires a HDMI to DVI adapter cable for a DVI only monitor. I had one and the HDMI port worked just fine for DVI. Hugely disappointed in the Flash issues, but otherwise a capable machine after some intervention from the end-user. There is no CD or DVD drive. I didn't realise this wehn I bought it and I can see no reason at all for not including a CD/DVD drive in the package. Compact and easy to set up. Good price and low noise. Great product, easy to setup perfect as a media center for music and films, also good for light office use such as word, excel etc. Low power and whisper quite, brilliant for day to day downloading and browsing the web.